A recent article from The New York Times has the web abuzz with speculation about a new iWatch device from Apple that will employ flexible glass technology from Corning. 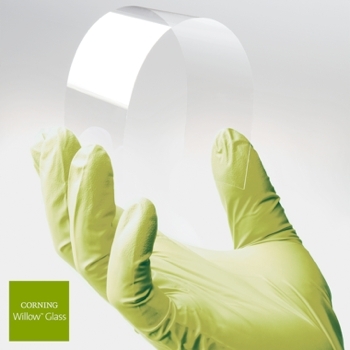 But even though samples of the company’s new Willow glass are indeed already in the hands of a few partners since June 2012, Corning says it will be at least another three years before we see the technology in commercial products. Implementing the technology has proven more challenging than initially expected, and according to Corning president James Clappin, companies have yet to come up with products that can take full advantage of Willow glass, which can be made in a roll similar to newsprint. He didn’t specifically mention Apple but said they're making “a lot of effort” to teach “very big name” customers how to handle the spools. "People are not accustomed to glass you roll up. The ability to take it and use it to make a product is limited." Of course, although flexible glass is a major technological advance in its own right, that’s only one part of the puzzle before actual bendable devices like those roll-up tablet concepts are a reality. In other words, what lies underneath Corning’s Willow glass needs to be able to bend as well. The technology might still show up in some simple products this year, though. Some examples mentioned by the company include a flexible barrier for solar panels or a thin film behind some touch panels. Clappin declined to comment on whether Corning had been in discussions with Apple about its rumored smart watch project. Corning’s Gorilla Glass is featured on 1 billion devices worldwide, including smartphones, tablets, notebooks, and TVs. Its latest Gorilla Glass 3 product announced last month should start showing up in products over the next few months offering three times greater scratch resistance and improved strength.